This is Part 2 of a pamphlet produced by Bob James for the 6th Biennial Conference of the Australian Society for the Study of Labour History, which was held 1-4 October 1999 in Wollongong. Part 1 is Secret Societies and the Labour Movement. Visit the Display Catalogue. Labour History, a political construction, is misleading history, if it is history at all. The Webbs, on whose ideology Labour History has been built, were intent on claiming to be 'modern' above all else. LH has wrapped itself in their mantle, and encouraged 'trade unions' and 'the movement' to claim to have forged a rationalist and progressive presence from a superstitious, irrelevant heritage. The Webbs argued that lodge 'ceremonies' were used by the British 'trade-unionists' as an artifice of stage-management to impress unsophisticated newcomers. To them, the Tolpuddle labourers were merely 'playing with oaths.' Under this Webb treatment the organisational function of the rite simply disappears, it is undeserving of any further exploration. The oaths cannot be part of a living culture reflective of the needs, anxieties, expectations or desires of the people using them. Thus live people disappear and only selected events and groups can be part of 'the real trade union movement.' Only committment to and membership of a certain organisational 'type' qualified someone as 'class conscious'. The Webbs appeared to believe that the whole lodge ritual package was abandoned if not immediately then not long after 1834, the year of the Tolpuddle trial. [ 2] If oaths, regalia, initiations, etc, did actually cease at that time they should not have reached the 'labour movement' in the USA or New South Wales decades after that date, which they did. It is not clear what 'Trade Union features' or 'objects' might mean here but the Knights began life in the USA in 1869 as 'The Noble and Holy Order of the Knights of Labor'. As a 'purely and deeply secret organisation' it drew heavily on Freemasonry for its ideas and procedures,[ 4] according to the author to whom the Webbs refer, Carroll Wright, who was at the time US Commissioner of the Bureau of Labor. Wright went on to say that a major change took place in 1881 when the Order's General Assembly agreed that for the first time the Order's name and objects would be made public and its initiating oaths abolished. In 1883 the titles of officers of the K o L central executive were altered from 'Grand' to 'General', viz, from 'Grand Master Workman', 'Grand Secretary,' 'Grand Treasurer', 'Grand Venerable Sage', 'Grand Worthy Foreman', and 'Grand Unknown Knight', etc to 'General Master Workman', etc. [ 5] Wright does not emphasise the fact that significant amounts of the Knight's ritual actually continued, including the use of a square altar and a red triangular altar. I don't accept that Freemasonry was the source of the Knight's lodge practices, but the evidence for that must not detain us here. Suffice to note that the co-founders all belonged to a number of fraternal organisations besides the freemasons, one, for example, being in the Pythians, the Odd Fellows, the Improved Order of Red Men, the Royal Arcanum and the Order of the Golden Cross. Powderly was in the Workingmens Benevolent Association, the Ancient Order of Hibernians and the Irish Land League all of which drew on the original guild model. Weir agrees that before 1882 the Knights' fraternalism was marked by secret ritualistic behaviour, and orally-circulated 'secret knowledge', while after 1882 their culture was more diffuse, open, public and literary. But he argues that the growth and political significance of the Knights cannot be understood if the ritualism is ignored and that the dropping of the ritual was a major reason for the internal collapse of what was in 1886 a million-strong, national labour organisation. He notes that in the 1890's surviving Knights returned to the oath-bound ritual and secrecy of the first phase and that 'long after labour fraternalism (had) faded as actual practice, it continued to shape' the labour movements' debates, policies and values. the founders dreamed of moving beyond the limits of 'bread and butter' unionism by creating an oppositional culture based on the brotherhood of all toilers. The Knight's key public attribute was, in fact, its inclusiveness. Sixty thousand (white?) women workers enrolled in the 1880's, including Susan Anthony and Elizabeth Stanton, while by 1887 there were 90,000 black workers enrolled. In these terms the subsequent embrace by the labour movement of centralised and bureaucratic organisation can be seen as a logical progression out of what to some appears to be a throw-back to archaic practices. The collapse of the Knights was also due in a major way to the onslaughts of capitalists after 1885 and financial woes induced by its sudden inrush of members. Further, throughout the eighties it was an organisation attempting to accomodate 'assorted Marxists, Lasalleans, anarchists, syndicalists and free thinkers' as well as numerous varieties of feminists, temperance advocates, and ritualists. As I've said, Terence Powderly, the Knights leader during the Order's rise and fall, was the key advocate of the significant shift to making the Order's affairs public. He was not anti-ritual, indeed he died a 33 Degree Freemason. Rather he understood that ritual was central to what the Knights saw as its role of educating its members about political economy and their position in society. He also knew that secret signs and passwords were necessary and had to continue no matter how 'public' the Order was. But he was a devout Catholic and was attempting to defuse the attacks coming from Catholic clergy which were impeding recruiting. Catholicism, of course, resembles the most patriotic, Tory authorities in its dislike of other people's 'secret societies'. It does so only because it cannot control those whose beliefs are hidden from it, and which are therefore threatening. WW Lyght brought the Knights of Labor secretly to Australia by first establishing an Assembly of the Knights at Wagga in approx 1890, and one at Sydney in 1891. In my MA thesis on the role of anarchists and anarchism in the heady days of the 1890's in Sydney and Melbourne I was able to make few connections between home-grown activists and WW Lyght and so the Knights of Labor appear there only as incidental colour. Today I feel that the almost absolute invisibility of this 'WW Lyght' person and the wider context I've been able to put together suggests a closer look might be in order. Certainly the name of Larrie Petrie will be known to some of you as an influential labour radical of the time. He was among the first to join the Knights, doing so at Wagga before coming to Sydney, before ultimately heading off to Paraguay with William Lane's refugees. How long the Wagga and/or the Sydney Assembly, or any network of Assemblies in Australia lasted is doubtful but the membership of the Freedom Assembly, Sydney, from 1891-93, included many well-known labour-movement figures - William Lane, Ernie Lane, Arthur Rae, George Black, Frank Cotton, JC Fitzpatrick, WG Spence, WH McNamara, Henry Lawson and Donald Cameron. That it operated as a secret society is clear, but how much of the US-derived ritual set out in documents was used is not. Codes and Passwords were certainly used. Titles apparently used in meetings included Master Workman, Worthy Foreman, Past Master Workman and District Master Workman. These titles are standard lodge practice. The 'Secret Work and Instructions' contains directions for passing through Outer and Inner Veils, for hand-signs and excluding strangers, and for ritual use of the globe, lance, triangles, circles and other shapes. These are all explained in Weir's book. The 'Inner' and 'Outer Veils', for example, are terms for the ante-room and the main lodge room used to maintain secrecy. The lance and the globe, besides having various symbolic significances, were objects placed outside the one room or the other indicating the 'lodge' was in session. The published Preamble for a Melbourne-based Australasian Knights of Labor, (1893?) shows the names of leading Knights, who included Dr W. Maloney, MP, alongside initials which can be read as 'Past Master Workman', 'Grand (or General) Master Workman', 'Grand Recording' and 'Grand Financial Secretaries'. 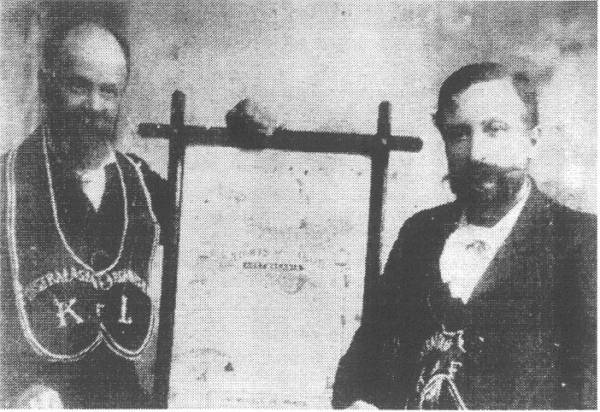 A photograph of Dr Maloney and JR Davies for the Knights of Labor shows both wearing standard lodge regalia. (See illustration below) Weir doesn't provide photos of regalia used in the US apart from ribbons and badges, and does not refer to any collars or aprons. It is possible therefore that this regalia was devised and made in Melbourne. shows both wearing standard lodge regalia. The Knights of Labor were not a radical aberration, they were simply another manifestation of a long-standing and deeply-rooted cultural phenomenon, the breadth and depth of which is still coming to light. This is not to resurrect the arguments about 'craft-based' occupations vs non-craft-based occupations. The significance of this material is much broader than that. It is not surprising to me that when the Newcastle branch of the Operative Stonemasons' Society was formed in 1885, 35 initiates were 'made' or that an apron produced for the Victorian Operative Masons' Society in 1906 is identical with what for simplicity sake I'll call the 'masonic' type. Tylers, or Door Guardians, are referred to in the Rules of Sydney Coal Lumpers, not established until 1882, the 1888 Rules of the United General Laborers' Association of Newcastle, and of the United Laborers' Protective Society of NSW, Newcastle Branch, 1892. This last body, of labourers mark you, lists in its assets for that Year: Banner boxes, Books, Regalia and other lodge Property to the value of �110 (out of a total �146/12/-). In addition to a Tyler the Rules of the Australasian Association of Operative Plasterers, NSW ('a grand universal bond of brotherhood' est. 1886) show for initiation of new members a catechism-form of questions and answers, strongly reminiscent of Masonic initiations. 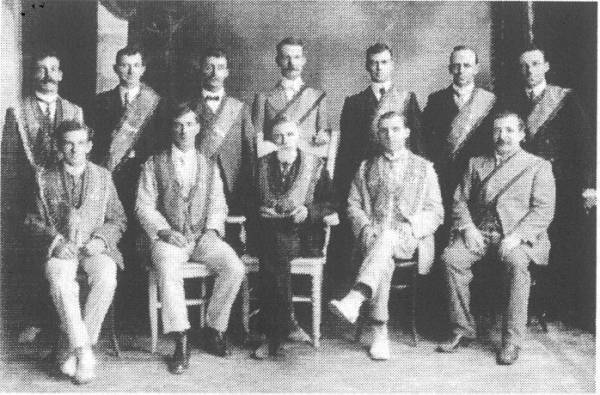 Photographs of the Broken Hill Executive of the FEDFA for 1913 show all wearing the same type of embossed collar or sash as for Masonic or Friendly Society ceremonials. At the laying of the foundation stone by Ben Tillett of the Broken Hill Trades Hall in 1898 'masonic' collars and sashes were worn by officials of the Committee. Up to the 1960's in Australia the AEU and the United Society of Boilermakers and Iron Shipbuilders were swearing in all apprentices and new members with an oath. Whatever the peaks and troughs, the evidence certainly argues that to generalise about 'Freemasonry' and 'elitism' is to miss the point and that in the decades either side of the turn of the 19th/20th century working people re-affirmed their need for the bundle of beliefs and practices here labelled 'lodge' or 'benefit society' in a number of different sites. Given that the 'ritualism' being objected to was a symbol for the power and trappings of High Church hierarchy, the relationship of 'Masonic' iconography and 'Romish ritualism' to Labour Days must have been an issue to trade unionists whether Catholic or not. It would also seem that 'the austerity of Methodist Christianity', its 'disdain of the lighter side of life, its cultural philistinism' might have influenced the nature of labour ritual. It was, however, the Catholic Church which both retained its ornate services and was increasingly significant within the Labor Party. This in itself suggests either no strong interest in ALP circles in reducing ritual as trappings of a non-democratic enemy or that ritual was central to all of the organisations in the competition for members. Brief newspaper reports show that in the 1880's Court True Freedom, a Newcastle 'lodge' for the Independent Order of Free Thinkers, initiated new members and had ceremonies and markers for ranks and degrees. This ties in with the fact that well-known English Free thinker Charles Bradlaugh remained a Freemason all his life, having been initiated into the same lodge of which Karl Marx was a member. How successful they were remains to be seen. Membership of Friendly Societies where ritual fraternalism was also strong was at its peak in the 1890's-1900's. This fact has added significance in this 'labour movement' context. Australia has a long tradition of private hospital and medical insurance, which had its origins in nineteenth century friendly societies, church and charitable organisations. Friendly societies and trade-union insurance schemes flourished, but few skilled or semi-skilled workers took up the cover offered. Serle, it turns out was quoting the PhD thesis of Eric Fry, influential LH'n keen to deny legitimacy to any working peoples' organisations other than 'trade unions' or their parliamentary representatives. There is far more than ownership of 'medical insurance' at stake here, but in this instance 3 authors are recycling inaccurate history without any of them bothering to do any primary research. Before the First World War half or more of the population in Victoria, South Australia and Tasmania were directly benefitting from friendly society services, as were more than 40 % of New South Welshmen. And even in the more sparsely populated States of Queensland and Western Australia, between a quarter and a third of the population enjoyed friendly society services. The collectivist ethos of the Australian people has been written about but the popular conception is only a pale shadow of the truth. In the UK where a little more attention has been paid to them, one 19th century academic concluded that 'the influence exercised by the friendly societies cannot possibly be overestimated' while another argued that 'the political liberty of Western Europe has been secured by the building up of a system of (these) voluntary organisations..' But even to British observers the enthusiasm late last century in the Australian colonies for 'mutual aid' and for 'the forms and ceremonies' of what some knew as 'Oddfellowship' seemed 'excessive'. Kincaid has written that in the early years of this century British politicians trembled before the political influence of the friendly societies and the insurance companies (and that) State-run social security was only possible because of the increasing financial difficulties of friendly societies from around 1900. I'm still gathering material for the Australian version of this, but by eventually breaking the strength of friendly societies the BMA/AMA in the 1920's 'achieved its aim of the right to control the conditions of medical practice and established fee-for-service as the mode of medical treatment henceforth.' Having adopted a State-oriented ideology Labor power-brokers did not contest this by supporting the friendly societies, rather they argued the result was one more proof of historic inevitability. And that the practice of State-welfare was theory-driven. The first ALP Premier of NSW, JT McGowen, in fact introduced old age pensions in his State because his experience in a friendly society had taught him mutuality plus saving was a good idea. He recognised the inherent vulnerabilities of 'benefit societies' but what he forgot was the need for personal responsibility within the collective. As it happens McGowen was also a thorough-going Freemason and was one of the labour stalwarts who made it possible for Lord Carrington, State Governor and Grand Master of the United Grand Lodge in NSW to lay the foundation stone of Sydney's Trades Hall in 1888. Many histories will tell you that Lord so-and-so laid the foundation stone of this or that, but won't tell you that the ceremony was actually conducted in what we might call the 'masonic' form, even when no Freemasons were there. It wasn't simply the Freemason's social status that brought this central role about, nor their usually being given credit for the bundle of ideas and practices referred to here. The Order had a great interest in benevolence and the transmission of cultural values, but in addition, and its story has to begin with it being regarded with great suspicion by British establishment figures for its Jacobin leanings. All lodges, today, are in decline, and the loss of membership of 'trade unions' is just one part of that. At a time when Australian mateship is being denigrated and generational dysfunction is widespread, there is little awareness of what used to tie communities together, what 'solidarity' can mean or how the 'labour movement' built itself in the first place. 1 S & B Webb, The History of Trade Unionism, Longmans Green, 1920, p.146. 2 Webbs, 1920 as above, p.182 for general claim about 'unlawful oaths'. 4 C Wright, 'An Historical Sketch of the Knights of Labor', Quarterly Journal Of Economics, Jan, 1887, pp.141-2. 5 See Wright as above, p.143 and p.155. 6 See T Powderly, The Path I Trod, AMS Press, New York, 1968, (orig 1948); pp.35-38 - his Christianity; p.42, p.43, fn6. - Industrial Brotherhood; pp.47-53, p.384, pp.431-440 - ritual and symbols of K o L; p.57 - Knights of St Crispin; p.230 - C Wright; p.318 - Order of Machinists; p.370 - Knights of Columbus; R Weir, Beyond Labor's Veil, Penn State U, 1996, p.8 for comments on the Knights of St Crispin. 7 R Weir, Beyond Labor's Veil, Penn State U, 1996, p.22. 8 Weir, as above, p.24. 9 Weir, 1996, as above, p.9. See his Ch 1 for much of what follows. 10 Weir, 1996, p.46, quoting Rachleff, Black Labor in the South, p.157. 11 Weir, as above, p.36. 12 Weir, as above, p.65, p.35. 13 Weir, as above, p.239. 14 For Assembly Documents see Adelphon Kruptos, and Secret Work and Instructions - Knights of Labor in Mitchell Library, at nos ML366.974/1A1,2A1,3A1. 16 K. Simkus, Lodge St John, No 115, 1884-1984, Newcastle, 1984, p.17. 17 See photograph, Reeves, 1988, as above, p.18. 18 Copies, obtained from various sources, in author's collection. 19 Original held at FEDFA Office, Broken Hill. 21 Broome, 1980, p.88; see also 'Methodism vs Ritualism', The Methodist, 9 Feb, 1901. 22 K. Whitley and E. Clancy (eds), Great the Heritage: The Story of Methodism in NSW, 1812-1975, NSW Meth Conf, 1975 p20; also, N. Gunson, Messengers of Grace, Evangelical Missionaries in the South Seas, 1797-1860, OUP, 1978, espec p.182. 23 One commentator has opined that at this time the Australian Catholic Church 'was more ultra-montane than any other in the world'- Book Review, by D. Baker, of J. Ward, Empire in the Antipodes, Arnold 1966, in JRH, 5, 1968, p.86; see also T. Suttor, Hierarchy & Democracy in Australia, 1788-1870, MUP, 1965, espec pp.43-45; bibliography at J. Monie, Victorian History and Politics, Borchardt Library, 1982, Vol 2, pp.537-542. 24 'Methodist Church of Australia', ML MSS Am-123-2. Methodist Girls' Comradeship Handbooks showing Ritual, Regalia, Passwords, Signs and Countersigns, Knocks and Counterknocks, etc, were still being issued in 1960. 26 Don McClaren of Dungog, to the author in September, 1992. 27 NMH, 5 Sept, 1885, 24 August, 1885. 28 O Yorke, The Secret History of the International Working Men's Association, Geneva, 1871, reprinted 1974 by Revisionist Press, Dublin, p.66. Copy at 'Geoff Macdonald Collection', NQ4/1413, ANU ABL. 30 E. Caspersz, What Is Universal Co-Masonry?, (pamphlet), Sydney, nd, p.6; for Andrews and Isis Lodge see Dwyer Collection, Mitchell Manuscripts, MSS 2184. See also J. Roe, Beyond Belief: Theosophy in Australia, UNSWP, 1986, from p.196. 34 Roe, 1986, pp. 167, 186, 196. 36 See D Lefebvre, 'Macons et anti-macons socialistes (1906-1912)', L'Ours: Cahiers & Revue, No 193, 1988. 37 Quoted at J Hamill & R Gilbert, World Freemasonry, Aquarian, 1991, p.181. 38 C Dilke, Problems of Greater Britain, 1890, pp.539-40. 39 E Willis, Medical Dominance, Allen & Unwin, 1983, p.77; L Bruch, The Sweating of the Medical Profession by Friendly Societies in Australasia, 1900 (copy in Mitchell Library).